Happy Tuesday! Hope everyone's week is off to a great start! 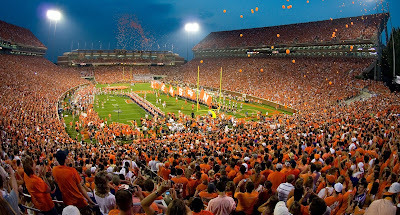 I am counting down the days till Friday when we take off to South Carolina for the big game day weekend to watch the Clemson Tigers play the Georgia Bulldogs! I bought this little couture dress from the Mamie girls of ShopMamie.com. They had the cutest booth set up at the Richmond Bizarre Bazar in April and I could not resist! 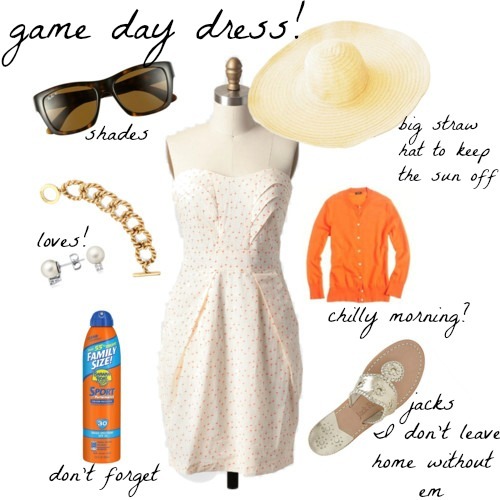 The second I saw this dress I knew it would be perfect for Clemson's first game. 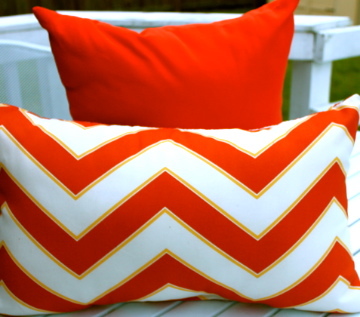 I love that it is an ivory color - so classic for Labor Day weekend and could I ask for anything better than little orange palm trees? Hello South Carolina! You should def check out their website, they have some great pieces and all of their "hand picked" clothes are under $100. up close and personal - are't those little palms cute? What kind of southern gal would I be without something monogramed on at our tailgate? I received this sunhat as a belated present for my Monograms and Mimosa bridal shower and I just love it! It makes me feel so feminine and classy! It also keeps the sun off my shoulders while I am not under the tents! So, if you know me, you know that I am not really much on wearing makeup (except on special occasions) but I am a firm believer in wearing sunscreen! I am a pretty pale girl and love to lather on 30 spf if I am out in the sun for more than 30 minutes. Shades also are.a.must! That sun can be brutal in the South! no explanation needed! Pretty sure that most have a pair (or two) laying around! Since it is still August, I wanted to keep my jewelry easy and light! I am going with a gold bracelet that I bought myself as a birthday present at C. Wonder in Atlanta and my pearls. Tip! Don't wear anything too constricting or heavy - it can get hot and sticky out there and the last thing you want is to be uncomfortable. 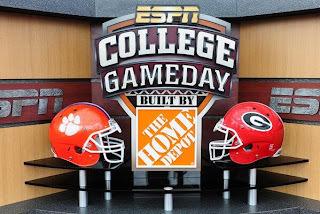 On the flip side, we are going to be out at this tailgate/game from 10am till close to midnight (Clemson has the 8pm time slot this year - NOW you know why we are sooooooo excied!) and I get cold at the slightest little breeze. 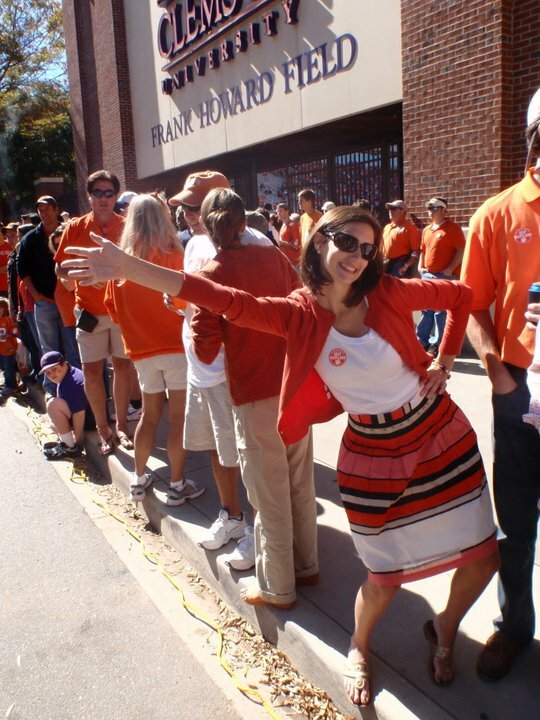 I rarely go anywhere without a Jackie Cardigan so I def have my Clemson orange one already packed! Well, I think that about covers it other than my undergarment! I am looking forward to posting some fun pics from the game and tailgate to show off the ensemble! 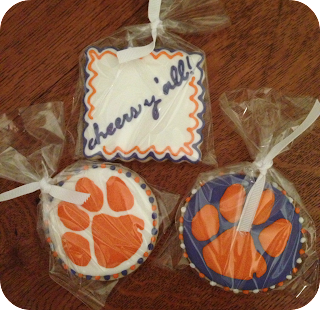 Check back tomorrow - I am linking up with another one of my Clemson Clan on her blog to help celebrate this kick off week! oh yea! I am not advertising for any of the above mentions - I just love them! 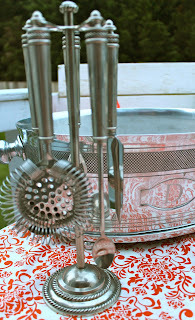 Oh and if you are lovin this blog leave me a sweet note or follow me!!! Do you know what this week marks? I am sure most of you do, but if not, it is the first week of college football! Now, if you would have asked me 5 years ago I would have said ummmm... the last week of summer?? 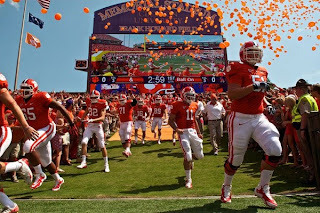 I can thank my crazy tiger lovin hubby for all of my cra cra Clemson football passion. Hah! I did not even go to Clemson but love* it just the same! 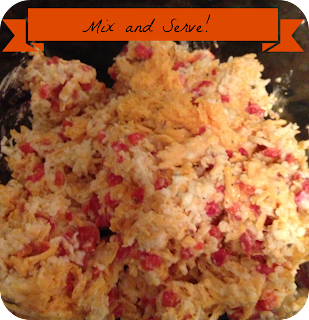 As you know, this week I will be blogging all about southern tailgating...Clemson style!! !...but I will not be offended if you change the color scheme to match your home team! So now I ask y'all, are you ready for some football? me waiting for the parade of tigers, a made up name but def one of my fav traditions! 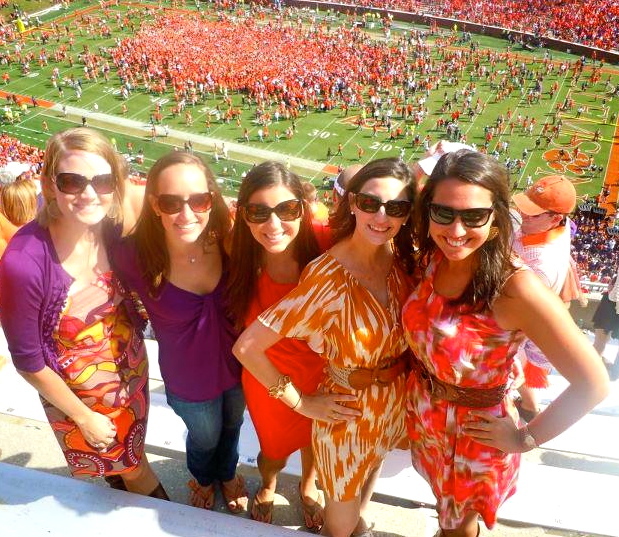 We are so lucky to have such a wonderful Clemson Family and have the best time when we are all together! Most of these boys have known each other since high school and this group of 7 have grown up along side each other into wonderful men! These 7 are all either married or engaged to great gals (thus my entry into the club) and if it weren't for these ladies I would never love Clemson as much as I do. Isn't there a southern saying that goes something like "behind every good man is a strong woman".... well we have to be to put up with these clowns when they all get together! Our tailgate bucket has grown over the last 4 years to include a L.L.Bean bag, big plastic tote and the original orange bucket. 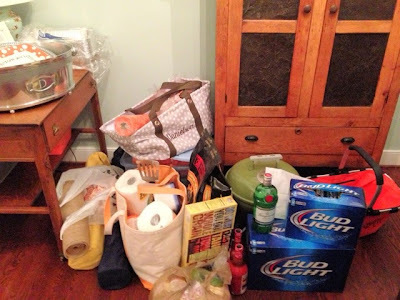 It seems the amount of items that we need grows just a little each year! 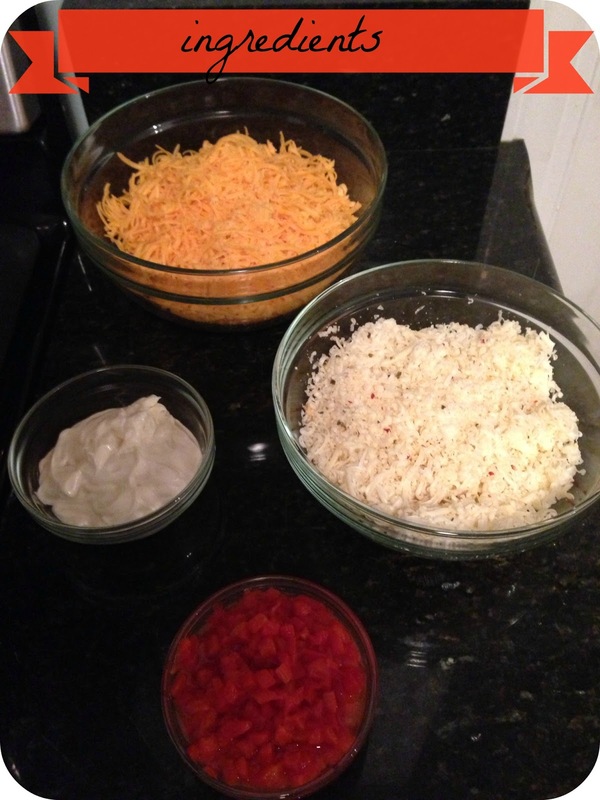 How can you have a successful tailgate without a dedicated day of prep? We spent most of yesterday running errands and pulling out all of our tailgating gear. Man, I am so glad we did because I think I left a roadie mimosa in my Tervis Tumbler from the final game last year - oops! 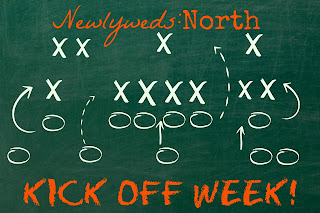 Nevertheless, take this opportunity to restock your tailgate bucket (if you already have one, if not invest in one), wash up your monogramed cups and dishes, make sure your gear is in working order and set it aside so it is ready to rock and roll when you need to pack the car. 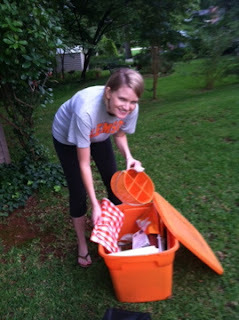 Some of our Clemson family sent pictures as they were preforming their tailgate prep! Check in tomorrow for more tailgating ideas from the Mrs! *disclaimer - Don't worry Mom, Dad and Bro, I still have a big place in my heart for UVA! Did you know it is only 8 more days till the first offical day of college football? I am thrilled to be heading down to South Carolina next weekend to watch Clemson play/beat the University of Georgia in their season opener. We are so lucky to not only have a night game but ESPN Game Day is going to be on campus for the big event! 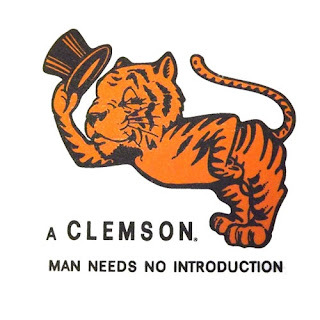 Now I did not go to Clemson, I went to a very small college that did not have a football team so my love for this team comes solely from my husband who lives, eats and sleeps Clemson. What can I say? 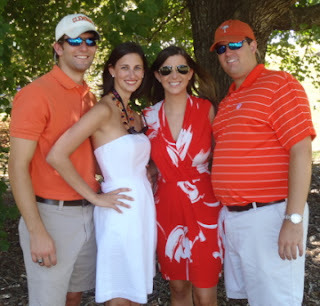 I totally drank the orange cool aid and I really love a good southern Clemson gentleman! AND What kind of southerner would I be if I did not love a good tailgate? 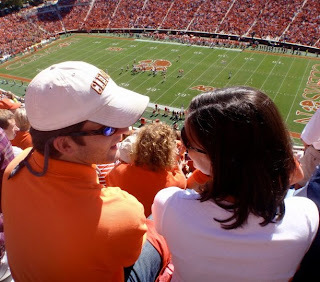 I have been planning, along with my good friend Ashley, for the Clemson/UGA game for the entire summer. 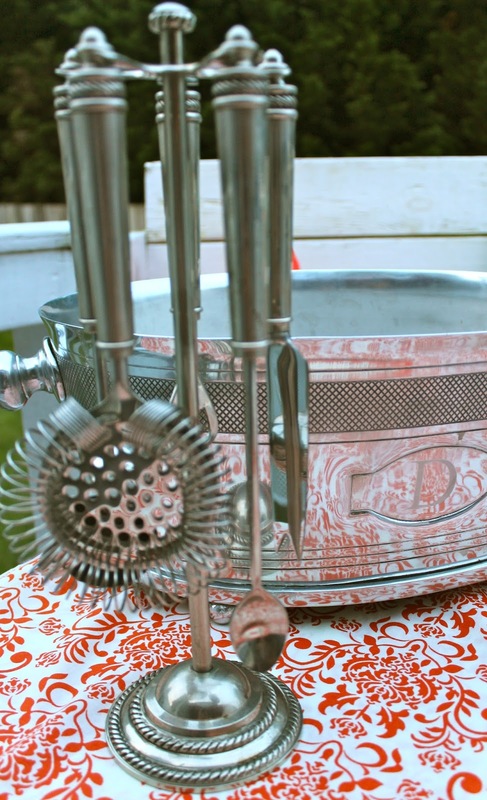 Next week on Virginia Sweet will be jammed packed with tailgating ideas; including my game day outfit (that I admittedly bought in April for the first game day), tablescape ideas, tailgating menus, and small details that only a southerner would think of! I also wanted to point out that southerners take this tailgating thing very seriously, especially at Clemson. 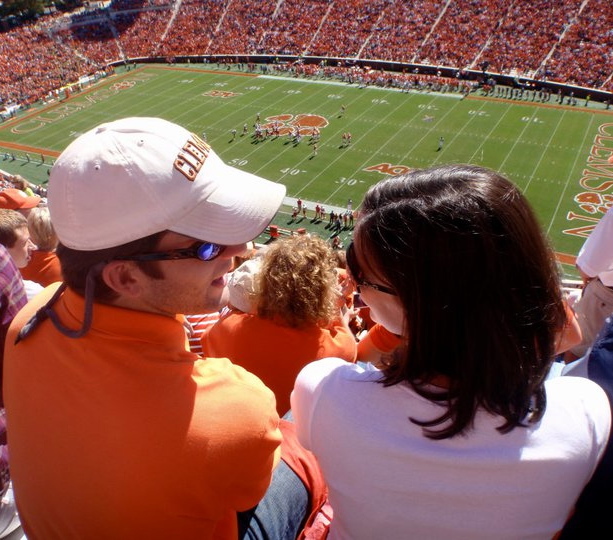 I read here, that Clemson actually won the best tailgating in the South in 2012. That is a pretty big deal, considering all the great southern colleges and universities out there! So join me next week as we kick off tailgating season with a tribute to true southern tailgating - Clemson Style! Hey y'all! Ready to pick up where we left off yesterday? Well, let's get right into it, I think our next stop will be one of my favorite rooms in the house because I love love love it! So, as you will see most of my downstairs is some shade of gray so in the dining room I wanted to be a little more bold. Don't worry, I still went with a shade of gray, just a much darker one. I was having a hard time finding the perfect inspiration for this room until my sister-in-law introduced me to Williams and Sherrill, a wonderful fabric and home decorating store in Richmond. I was in love the second I stepped foot in the store and knew that this was a very bad idea for my pocket book! Any-who, it was there that I found this wonderful pale blue fabric with birds in really fun colors. 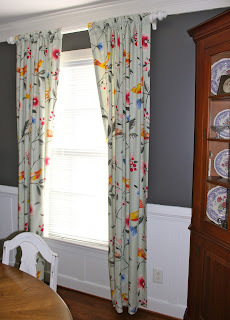 The blue/gray color of the fabric really works nicely with the color in the kitchen and living room and the birds add just the perfect pop of color to compliment my corner cabinet full of my grandmother's china. 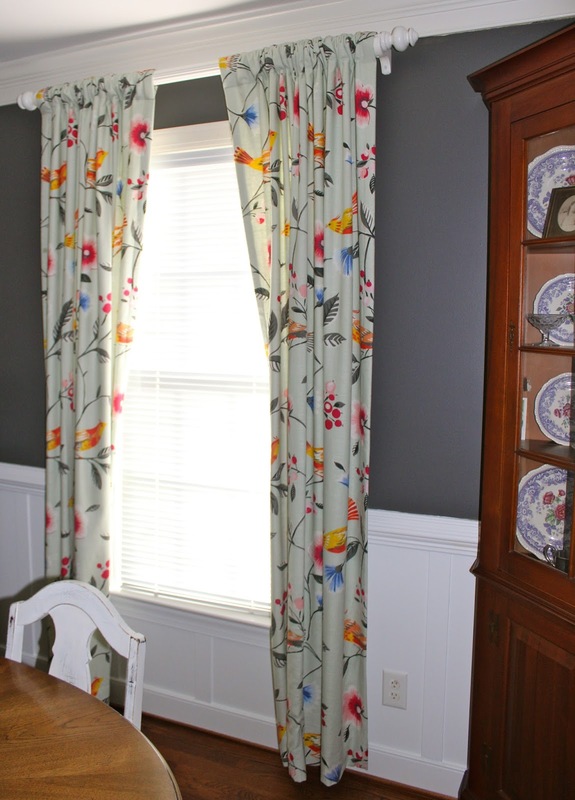 I pulled the gray/navy color out of the fabric for the paint and ended up with Peppercorn by drum roll please... Sherwin Williams - who woulda thought?? Reid actually did the board and batton beneath the chairrail himself and I love the way it turned out! Random fact: Reid and I actually enjoy antique shopping as a couple! We used to go to this awesome antique stop in Charlotte called the Sleepy Poet about every other Sunday to walk off brunch and day dream. Now that we own a house, he is not as egar to go antiquing since we usually come home with the most random stuff but we have had some really good finds in Richmond. We found our 4 dining room chairs and head chairs at West End Antiques and our table at Impulse. Impulse is this awesome consignment store that is literately in walking distance to my house... Trouble with a capital T! Here is a snapshot of the chairs we bought for the ends of our table. I am in the process of recovering them in the gray and white fabric (they were an awful yellow fuzzy fabric) - also a great find on sale at Williams and Sherrill! Well, when I say "process" what I really mean is it has taken me 6 months to do one back, but HEY who is counting? We are also planning on painting the bottom of the table and chairs below but really not sure what colors yet? Got any ideas??? I spy a little boo! 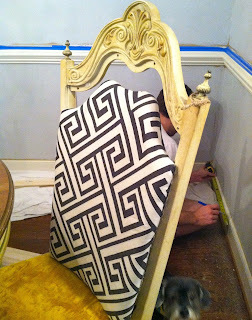 Overall, I am really excited about the way this room is turning out! We still have some items on my "to-do list" to check off but we are off to a great start. oh wait! 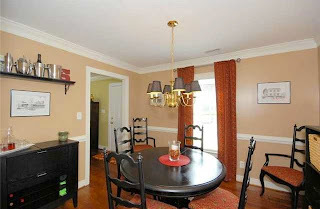 Didn't you want to see what our dining room looked like before we moved in?? ps...while you are here, why don't y'all follow me? It is easy, just look over to the right!! 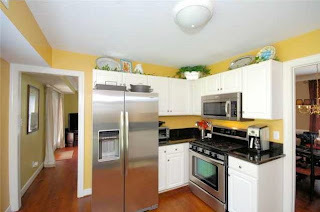 As promised from Monday's post, I am working on the before and after shots of my home and thought I would start with the kitchen and breakfast nook. Mainly I wanted to start with these rooms because my house just got cleaned yesterday and they get the messiest the fastest! So, are you ready to begin the tour? this was our breakfast nook before... the whole kitchen was this yellow color! We spent a lot of time deciding what color to paint this room. 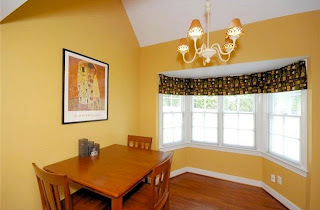 First, we had to cover up this crazy mustard yellow color, second, we had a lot of wood going on in this room so the paint color had to be light and neutral and third it opens right into our kitchen so whatever color we choose was going in there as well! 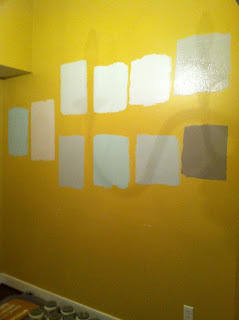 After many, many, many samples we landed on the perfect color - Sherwin Williams Rainwashed. It is a lovely shade of blue/grey and really complements the wood floors and dark wood antiques. We, and I mean Reid when I say we, repainted our entire downstairs ourselves. 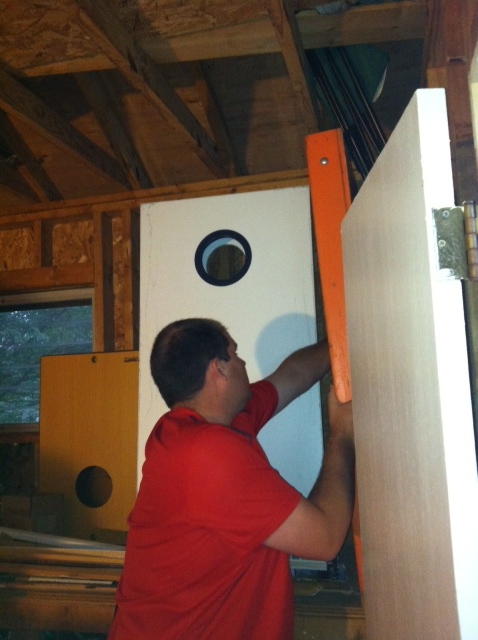 This room of our house is vaulted so it was no easy task but what can I say - I have a handy husband! All the furniture in this room are antiques, dark oak/wood antiques which makes it sorta monotone but I love them. Isn't that pie safe amazing, it orginally belonged to my parents who brought it back from their adventures in England. They re-did their kitchen a couple years ago and no longer had room for it - SO lucky me because lord knows I need the storage!! 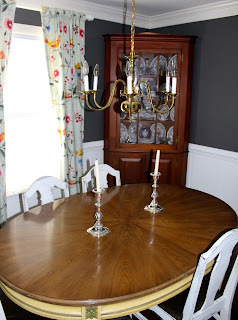 The table came out of my great Aunt Jane's house where it was loved and used for a long time. The desk below that we use as a mail center was a random antique that used to be in my room as a little girl. 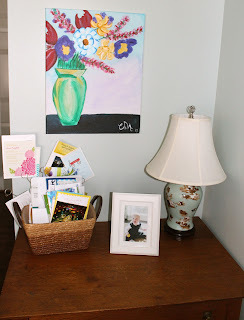 And yes, I did paint that picture at one of those "let's get together, drink wine and paint by numbers type of thing." I spy my little nephew!! This room opens right into our kitchen and is divided by a peninsula that houses our sink and makes a perfect place for our monogramed theme bar! can anyone say "wedding presents?" 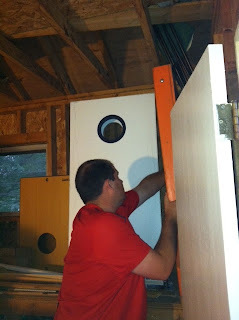 We really have some storage issues in our kitchen because it is really small! Reid gets after me all the time that we have too much stuff, well, what's a girl to do? 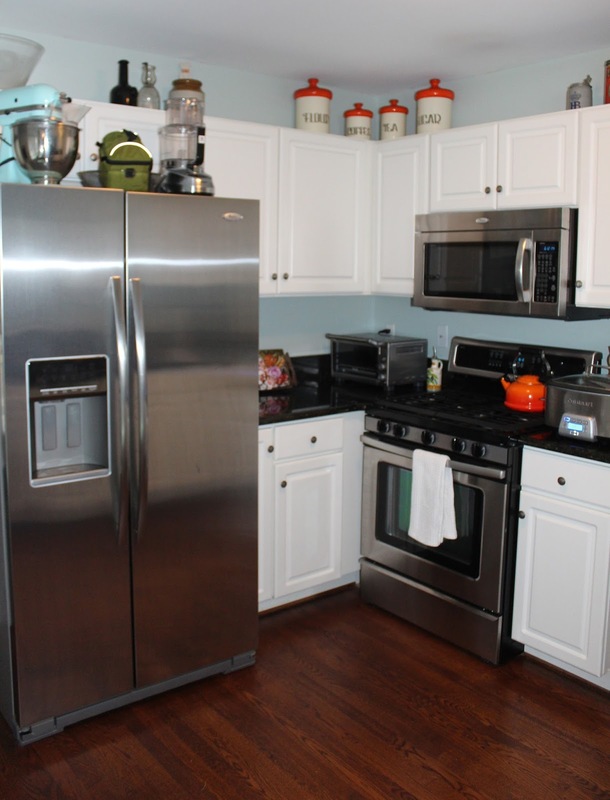 I will get it organized at some point but for now I am more excited about ordering our new kitchen lighting and installing our new fun touch faucet for the sink! Yay for working in the plumbing and lighting business!! 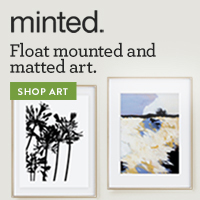 Check back tomorrow for a peek of our living room! So truth, hah, I sat down last night to compose a completely different post than what I ended up writing... 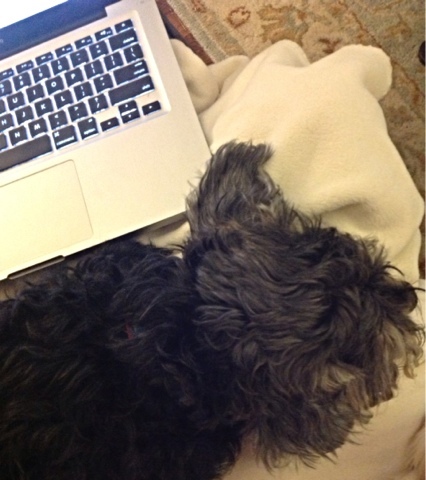 I started to do a before and after of our house but then this little guy crawled into my lap and laid right on my computer. how do you make this little cutie move? Oh Sampson, you pretty much stole my heart the first day I met you and you truly were my first love. We have been together for 10 years as of this summer and even with your gray hair you still make me smile everyday. So why not dedicate an entire post to you? The moment I heard that Kristen (my college roommate of three years) and I were going to live off campus our Junior year my dog hunt began... I was all over the SPCA websites and petfinder.com looking for the perfect pooch. I came across a random listing for a part schnauzer, part yorkie mix named Toto with no picture attached. 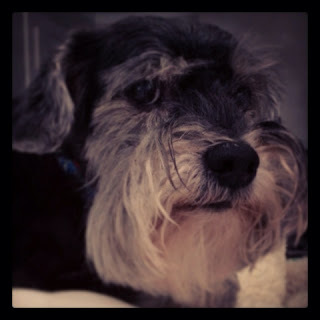 Having grown up with a couple family members who were schnauzers I was immediately planning a trip that very weekend to the shelter to visit this said Toto. My parents again tagged along, they are always doing that, and tried to talk me out of getting this dog. When we pulled up to this sorta sketching looking shelter we found this practically bald, mange infested, mean, growling dog that had been passed around from shelter to shelter for over 6 months. 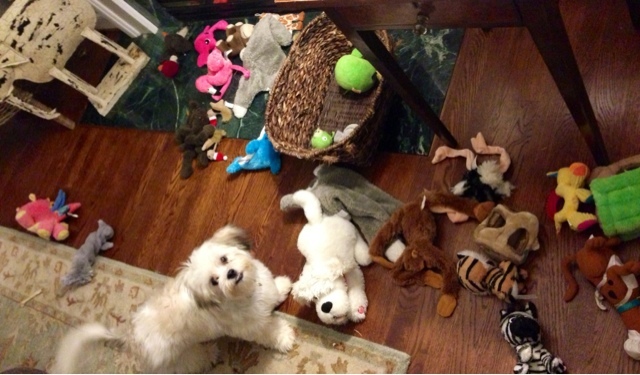 So there I was, in that nasty shelter where Toto was miserable Town, USofA and being a complete terror and what did I do? Well, I took him home of course! I did ask the lady if she would hold my check for a week because I did not know what I was getting myself into. But when we put this dog in the car, he immediately jumped into the front seat and looked back at us like "are you clowns coming or what?" Yup, I knew, in that instant that this dog was going to be apart of my life for a long time. He got a new name of course, Sampson, and a much needed bath and time for his hair to grow back and then became just another member of our family. Now, I so wish I could say that he is the most wonderful dog that anyone could ask for, so great with children, and just really happy go lucky...but sadly he is not. I swear Sampson is a person trapped in a dogs body and is highly annoyed by his silly mommy trying to tell him what to do. He is grumpster and does not like strangers, children, bikes, children on bikes, adults on bikes, anything with wheels, delivery men, toll booth workers, his sister Tuggy...the list really could go on and on. Sampson does have some awesome qualties about him. He is a super classy fellow and loves to wear a good bow tie every now and then, he is an excellent singer and very good at balancing like a badger on his back legs! He much prefers to sleep on our bed or couch than on the floor, only eats his dinner we Reid and I eat ours and pretty much runs our house. Even with all his craziness he is our "little boo", a favorite nickname that Reid and I have for him, and we love him to pieces. In fact Reid and Sampson have a very special bond, I like to think that they choose each other. I am pretty sure that the reason Reid asked me to marry him is to secure his link to Sampson forever. We love you, you old man, more than words can ever express! You make us so happy and we cannot wait to get home everyday to see you! xoxo Sammie-Boo - We love you! Happy Monday y'all! 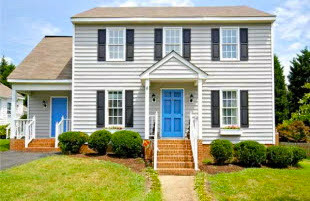 I thought it might be fun this week to share our home on Virginia Sweet so that all our family and friends who follow from far away can come for a quick visit! 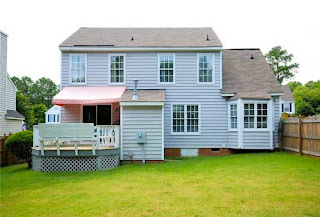 Last summer we looked and looked at houses in the Willow Lawn area of Richmond with our awesome Realtor Corbin Ryland but every time we fell in love with a house it either sold before we had a chance to go see it or we got into a crazy bidding war. We literally were about to give up when Corbin sent us an email saying that we should take a look at this house, it was outside of where we had been looking but it had a walk in closet in the master and granite countertops. say no more....a walk in closet in the master? Yes please! At our rental house on Patterson, I had been living out of three closets all about the size of a shoe box and most of the homes we had been looking at were not much better. So for this one reason we went to go look at this house. My parents happened to be visiting that day when Corbin took us through the house and I must say that we were excited. The house was built in the 90's and was so different than have we thought we wanted. It was right over the county line, which Reid LOVED since city taxes are higher and in walking distance to an awesome elementary school. It was still close to everything and just a stone's throw away from my little nephew's house. It had 3 bedrooms and a fenced in yard for our then one dog Sampson. It was just what were looking for and we put an offer in that day! just enough room for Sam and Tug to play! With a little negotiating, ok a lot of negotiating, a big check for the downpayment, the house was ours! We love our almost 1500 sqft home and it is just perfect for our 5-7 year plan. (Reid will not even let me think about another house for 4 more years!) We are quickly approaching the one year anniversary of being in our home and although I still need to unpack some things, we think the house is coming along nicely. I am excited to show you the changes we have made to our little piece of the world and want to thank our friend/reatlor Corbin for making us look outside of the box! What is it about pearls that just screams "hey look at me y'all, I'm a southern girl!"? Is it the fact that pearls add just the right touch of southern sass and class to any outfit? Or is it that most pearls have a wonderfully southern story behind them? Or every time a I wear my pearls, they serve as a gentle reminder of a special event in my life? My most favorite pieces have got to be my pearl studs, bracelet and garnet and pearl necklace. A pair of pearl stud earrings a can take a girl a long way with any outfit or event. Throw on your studs with any sundress or dress them up with that LBD (little black dress) and a fun, festive, big, chunky necklace. I pretty much wear them everyday, one because I am lazy and they hang out on my night stand and two, they just go with everything! 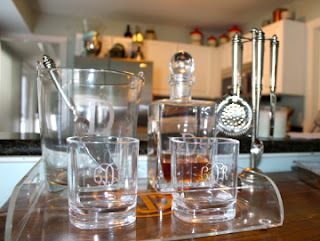 These little beauties were given to me by my parents for my 25th birthday. They wanted to give me something special, something that I could pass down to my daughter or (god help me if I have all boys) daughter-in-law one day. I love them, they are so classic and such a staple in my life! ahh, I see you have met my pearl bracelet! This old gal is a true piece of family history and held my hand during my wedding. The pearls and clasp came from an old pearl chocker that belonged to my great aunt Lucille, more affectionately known as Aunt Tooter.When I inherited this piece she was missing her third strand...so when I got married my mother had her restrung and made into a bracelet. Isn't she something? Her clasp is missing a stone or two but I love her just the same! The last lovely I will mention are the pearls my parents gave me for my high school graduation. A single strand of pearls is another true classic and a must have in any collection. This strand is just a little bit more special since it has a single garnet in the center - the garnet was my favorite stone in high school and just so happened to be the school colors, red and white. Are you seeing a trend here, clearly my parents really like to give me jewelry and who am I to stop them? I know that really my mother is a sap about family heirlooms and special occasions so pearls are the natural gift for any true southern girl. These pieces of jewelry have such wonderful stories behind them and many more memories to make. They are like any true southern girl, rooted in the past but ready for whatever the future may hold! So next time you are rooting around your jewelry box for inspiration, check out your pearls - they will never steer you wrong and are always a true southern classic!